Las Sendas Golf Club is considered the most challenging desert golf courses in Arizona. This Robert Trent Jones II design combines narrow fairways lined with thick dense desert vegetation on both sides of the golf course. Wide, fast, unsteady greens simply add to the already complex layout. The most amazing views of untouched natural desert may be seen from the golf course. Roaming wildlife, Saguaro cacti, Palo Verde and many other desert wonders surround the golf course from all angles. Southwest golf is brought to a whole different level at Las Sendas. 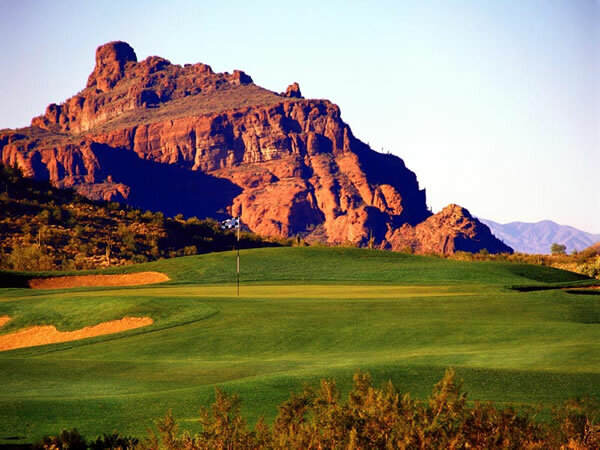 Rated one of the highest sloping golf courses in Arizona, this course will challenge you from start to finish. Strategic planning will be mandatory to score well on this target style desert design. This golf course is not recommended for the beginning golfer. From Phoenix Sky Harbor: Follow the airport signs to the Loop 202 E. towards Tempe. Merge onto Loop 202 E. and continue 17 miles. Exit Power Rd. via exit # 23. Turn left onto Power Rd. / N. Bush Hwy. Turn right onto Eagle Crest Dr. Course will be located on the right hand side of the road.